Arthur Reed Photos was started in 1960 by Arthur Reed and was an industry leader, always at the forefront of technology. 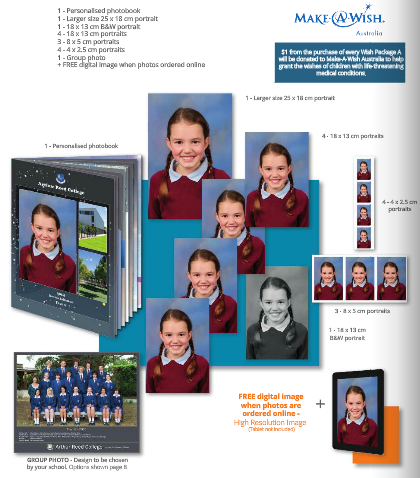 The business became famous for its school photography, including portraits, class groups, whole school photos, team photos, ID cards and school administration products. Arthur’s son Michael joined the business at 17, straight from school. After starting in the film processing area, he worked as a photographer for 20 years before becoming a manager and eventually taking over the leadership of the business from his father, who remained hands-on until his passing in 2013. Today the business continues to provide families with high quality photos, now taken on top of the range Canon equipment. It has 95 employees. Arthur Reed Photos has also expanded into student and teacher diaries, graduation gowns and sashes, framing, graduation rings and event ticket systems. It sells locally and interstate, producing in-house. Arthur’s granddaughter, Stephanie Reed, is now marketing and communications manager. “Being one of the largest school photography businesses in Australia means that we have fantastic staff with diverse backgrounds, bringing different skills and knowledge to our business,” she says. The business is very successful but Michael and his team wanted it to be even better. Despite its success, Arthur Reed Photos felt that in a changing industry it was time to focus their marketing efforts with a formal marketing plan. General Manager Jason Butcher, who previously worked for Business Victoria, suggested SBMS and Stephanie and Jason were matched with mentor Katya Ellis. Katya, Stephanie and Jason had three sessions over two months and mentoring is continuing. Arthur Reed Photos is very established, so the mentoring helped them develop a strategic marketing plan to support the business’s objectives. Options around A/B testing marketing campaigns. Confirming actions for a different branch of the business to focus on in the off-season. Katya says Stephanie and Jason have completed their marketing plan and identified relevant action steps and a timeline to complete them. “Developing a marketing plan is an essential way for businesses to review their product offering and current approaches to marketing, what is working or not, and analyse what their competitors are doing,” Katya says. Stephanie says Katya provided a framework to work within as well as consistency across the organisation. “The forms of measurement that are being utilised and put in place can also be applied to many others areas of the business,” she says. Stephanie says it’s the first time targets have been set across different departments, and the sales team now has clear goals based on financial growth, customer growth and loyalty. As part of the process she and Jason also worked on defining their customers, including schools and parents. “We had to redefine each different customer … and determine strategies to reach each one,” Stephanie says. Arthur Reed Photos now has marketing collateral to ensure that everything within the business is aligned with its vision of the future, including catalogues, flyers and pull up banners. “We have developed different discounts to offer our customers and many more services that we can now offer schools which we didn’t have in place,” Stephanie says. It is too early to tell if the new material has affected enquiries, bookings and sales. But Stephanie is confident it will. “It has given us the opportunity to take a step back and evaluate exactly where we are in the marketplace and how we are going to improve and restructure to be where we want to be,” she says. “We now have clear financial and customer goals that will be measured quarterly, as well as campaigns that can be executed throughout the year.